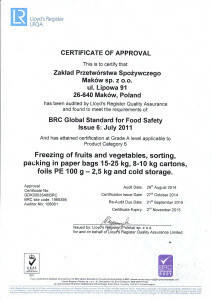 QUALITY AND SAFETY - ZPS "Maków"
implementation of modern quality control and food safety systems. Our frozen fruits and vegetables are made of the top quality raw materials –the quality assurance is guaranteed by long-term contracts with farmers. Our fruits and vegetables are frozen right after harvesting, which keeps all the flavour and nutrients. complete replacement of machine park and purchase of automatic sorters and new machines for fruit and vegetable retail packaging. In 2013 we have started to operate the new cold chamber equipped with system of sliding stands. We have also upgraded the water treatment plant, it now fulfils the requirements of the highest standards. 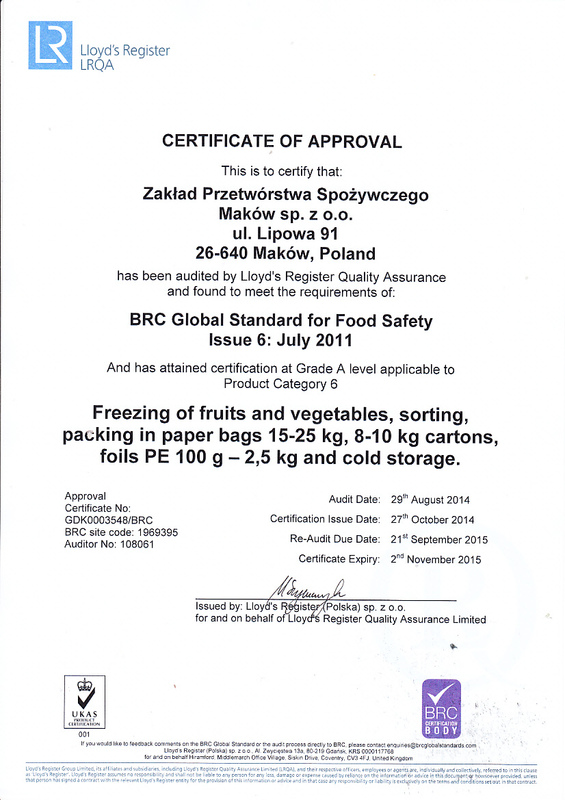 – BRC Global Standard for Food Safety. Implementation of our quality policy and constant improvement of the effectiveness of the quality system is in the interest of each employee, which consequently leads to meeting the requirements of the company and the customer.